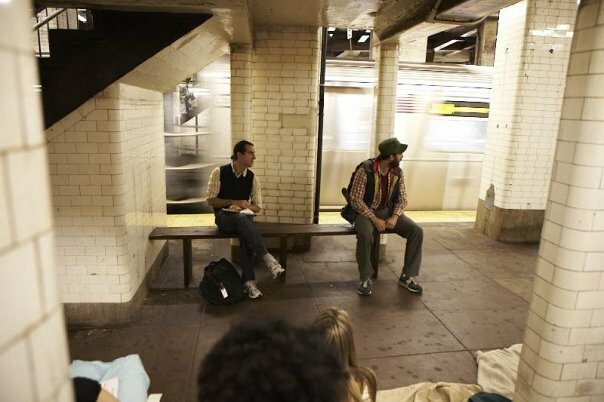 Firebone presented A Mysterious Way by Dallas based playwright, Steven Walters, on the NYC subway platforms. Chris Domig was nominated for the New York Innovative Theater Outstanding Actor Award for his role in this production. Jared Houseman played opposite. We revived this show the following summer, but were forced to move performances from the subways to a theater space by the MTA. Play Synopsis: Two men: a youth minister and a drifter. Two trains: both departing from the same place, for the same place, at the exact same time. A seemingly benign conversation between two strangers develops increasingly dubious as the true intentions of the wayward vagabond are revealed. This dark poignant drama takes a hard look at faith, evil, and the classic conflict of Man versus God.